At Computex in June, Micron announced that Crucial's Ballistix brand was being promoted to a standalone brand for gaming-oriented products. Their exhibit included three tiers of Ballistix DRAM products and one SSD: the Ballistix TX3 M.2 PCIe SSD. Based on Micron 3D MLC NAND and the Silicon Motion SM2260 NVMe SSD controller, the TX3 was to be Micron's first consumer/retail SSD with 3D MLC or a PCIe interface and was slated for a release sometime in the second half of 2016. Micron has informed us this week that the Ballistix TX3 program has been canceled. This leaves Micron's consumer SSD strategy up in the air. With the release this summer of the Crucial MX300, Micron moved their mainstream SATA MX line from MLC to 3D TLC NAND, casting doubt on the future of the value-oriented BX series and implying that their 3D MLC might be regarded as premium enough to be reserved for PCIe SSD. With the Ballistix TX3 canceled, we no longer have any clear indication of how Micron plans to move forward with their consumer SSD products. Micron may have decided to switch SSD controllers. 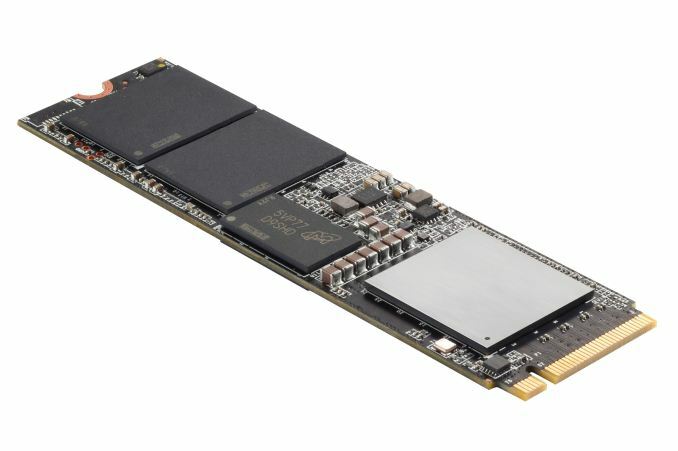 While Silicon Motion reported last week at Flash Memory Summit that final firmware for the SM2260 controller is ready, Phison's E7 controller is also available and ready to roll out, and Micron has been shipping Marvell's 88SS1093 NVMe controller on their 7100 series enterprise SSDs in both U.2 and M.2 form factors, albeit with planar MLC NAND rather than their 3D NAND. Micron may also have decided that the timing was wrong to be getting into a market segment that Samsung has been handily dominating; beating Samsung's PCIe M.2 drives on performance will be an uphill battle to say the least, and substantially undercutting them on price may not be possible while Micron is still ramping up production of their 3D MLC NAND. Micron's OEM and enterprise offerings may offer some clues to their plans, but the Micron and Crucial SSD product lines are no longer mere alter egos of each other. Micron's 1100 series SATA SSD is the nearest equivalent to the MX300 with the same controller and same 3D TLC NAND, but the 1100 is more a little more conservative by retaining the traditional power of two drive capacities with generous overprovisioning while the MX300 dedicates some of the extra capacity of Micron's 3D TLC chips to increasing the usable drive capacity. Micron is committed to delivering client PCIe NVMe solutions. While we are excited by the possibilities with our OEM partners, we are not disclosing availability details at this time. We will be sure to keep you updated as we are ready to share more. We are eager to hear what Micron decides to do, as they are still only the second manufacturer to deliver 3D NAND for the client and consumer SSD market and we have not yet had the chance to test their 3D MLC NAND. Competition in the consumer PCIe SSD space will be heating up with or without Micron's participation as more drives based on Phison, Marvell and Silicon Motion PCIe NVMe controllers hit the market over the next few months, but Micron's entry was particularly promising for the inclusion of 3D NAND. I really don't get this. Micron/Crucial is a U.S. company and I think actually makes their flash here (not 100% sure about that). They also do a lot of testing, and are just less buggy and weird than other companies. I really don't know or care if they're first or third or whatever in speed-all quality SSDs are orders of magnitude faster than mechanical drives, and all slow down massively in random reads/writes. Any differences are going to be imperceptible. I'm kind of nervous about new controllers. I've had good luck with Micron's Marvell products, and (in the past) Intel's Intel based products. Also hope they keep doing MLC drives. Maybe TLC is fine, I don't know, but it makes me nervous. Flash already makes me nervous enough.